For over 60 years, the SDL Atlas companies have been providing confidence in standard based testing through expertise and global partnering. 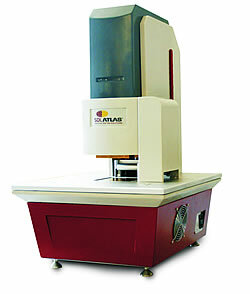 Our customers can be assured that they are making informed decisions based on accurate test results. SDL Atlas experts work closely with standards committees and retailers on development of standards. Our engineers develop instruments to meet these standards. Our service team calibrates the instruments to exacting UKAS and internal standards. High quality consumables that are consistent from batch to batch are also produced and distributed by SDL Atlas. Performance apparel, or garments that transport moisture away from the skin to the garment’s outer surface, represents one of the fastest growing sectors of the international textile and apparel industry. While performance fabrics require the typical tests of other fabrics, they also require an extra level of specialized testing to insure their engineered properties. 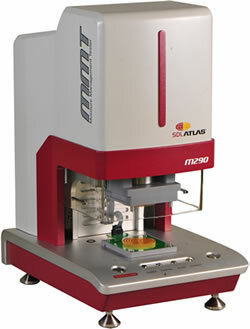 The SDL Atlas MMT® (Moisture Management Tester) is the only instrument on the market that can precisely calculate the liquid management properties of performance and technical fabrics, ensuring the comfort and protection that consumers demand. One 2-minute test gives a comprehensive profile of a fabric’s performance. What Specific Fabric Qualities Does the MMT® Identify? Spreading Speed for top and bottom surfaces What Types of Performance Fabrics Can the MMT® Identify? Comfort is a highly subjective perception, and the way a fabric feels is described as “fabric hand”. Clothing covers and interacts with most parts of a wearer’s body 24 hours a day. Since the skin is sensitive to pressure, friction, and heat transfer, it is important to characterize the tactile sensory properties of textile materials during wear. Provides strong correlation with human subjective touch sensations. Measures and distinguishes fabric touch comfort properties. Permits quality control and research & development laboratories the ability to measure and predict the comfort perception of fabrics. Excellent tool for communicating and relating comfort requirements among designers, the supply chain, and retailers. What Specific Objective Fabric Quality Assessments Does the SDL Atlas FTT®Identify?